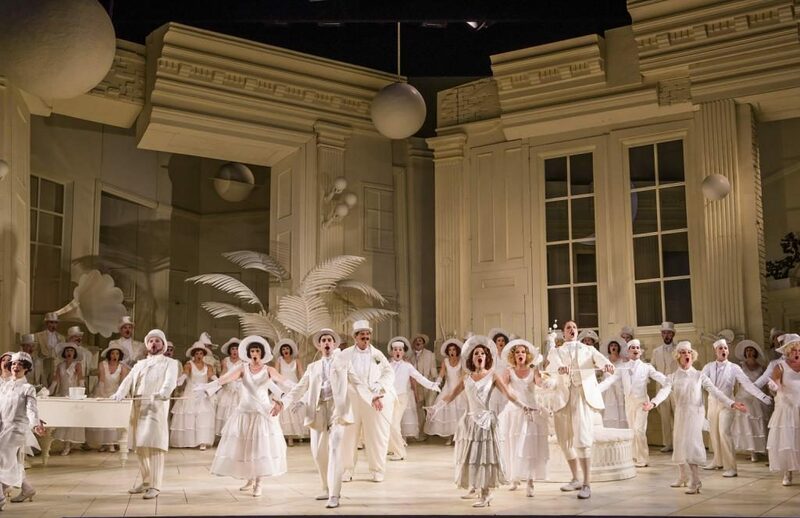 With a rump-tee-tum-tee-tum and a spring in my step I happily took my seat for a joyous revival of Jonathan Miller’s acclaimed Mikado at the ENO, London. This production is 25 years old now and still as fresh, funny and innovative as it was in 1986. 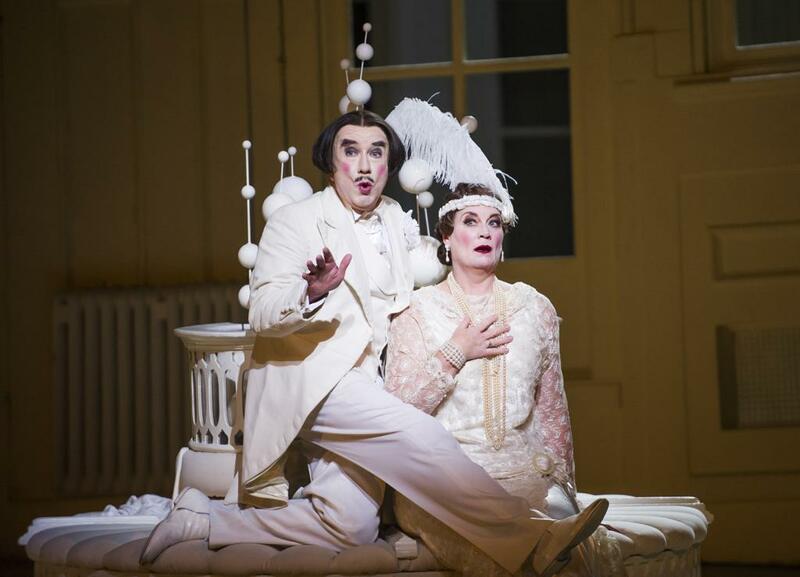 There have been many productions of Mikado, the biggest breakthrough came in 1986 with Jonathan Miller’s work. Miller sets the story not in the Japanese style of the original (although it is clear that Gilbert and Sullivan were actually poking fun at their own countrymen), but in a smart seaside hotel of the early thirties. Maybe inspired by the success of the black and white of the Ascot scene in “My Fair Lady” the late Stefanos Lazaridis has given us a purely white set of the hotel’s palm court complete with enormous white palm tree, white sofa, white planet like lamps and furniture, some of it stuck high up on the walls with the odd musical instrument thrown in to emphasise that Nanki-Poo, the hero, is disguised as a second trombonist. Offshoots of the main stage give room for much amusing business with maids running in and out and a bell hop climbing precariously on to a mantelpiece to water a pure white plant with a pure white watering can. The costumes of Sue Blane follow this theme with everyone in black and white and grey brightened only by little touches such as the men’s button holes and the girls’ wigs. The Mikado himself takes a relatively small part in the story and in his 20th century costume is made to look so comic it is hard to take him seriously as the feared overlord of the people in his fat suit, but this is all intentional to the humorous storyline. 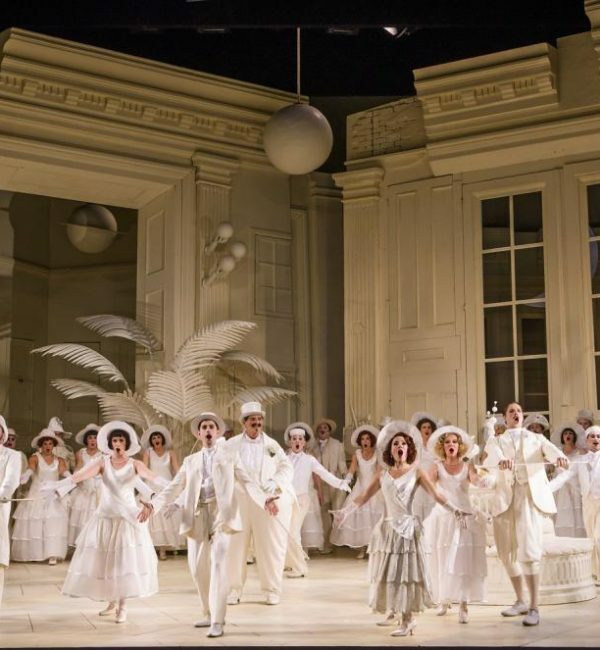 This revival production is directed by Elaine Tyler-Hall who started her career as a dancer and then worked as a dance teacher, choreographer and Benesh Movement notator, as well as assisting choreographers and directors on dance and opera productions. Tyler-Hall has worked on revivals of productions including The Cunning Little Vixen, Orpheus and Eurydice, The Fairy Queen, Rigoletto and Tosca in London, as well as travelling with Orpheus and Eurydice to New York City Opera. The title role is taken by Richard Angas, the original production’s Mikado. Richard Suart first appeared as Ko-Ko twenty five years ago has long experience and Donald Maxwell is a seasoned Pooh-Bah. Robert Murray is a sympathetic Nanki-Poo and Mary Bevan a sweet Yum-Yum and Yvonne Howard is an imposing Katisha as the Mikado’s self appointed “daughter-in-law elect”. All of the cast bring a new life to an opera that is perfect for introducing people to the operatic world, with an easy story to follow and delightful songs that will get you singing “Three little maids from school are we” all the way home! 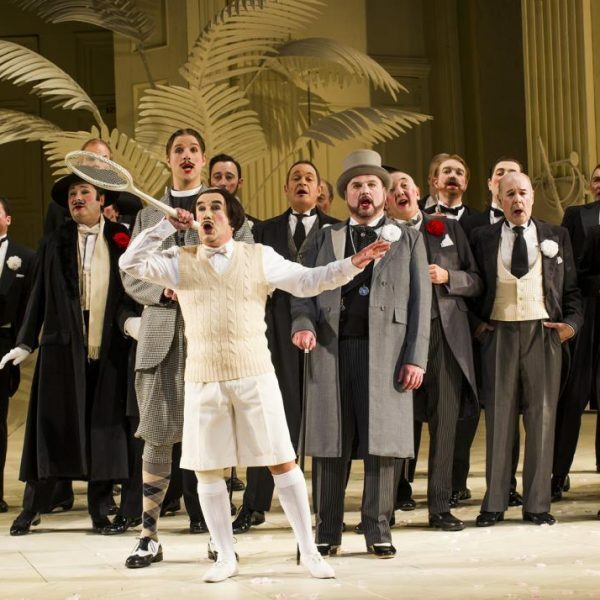 So despite its age, this Mikado remains a sprightly production and will serve a most suitable outing for anyone, as one of the lyrics say: Everything is a source of fun! The ENO once again prove you can’t keep a good opera down. 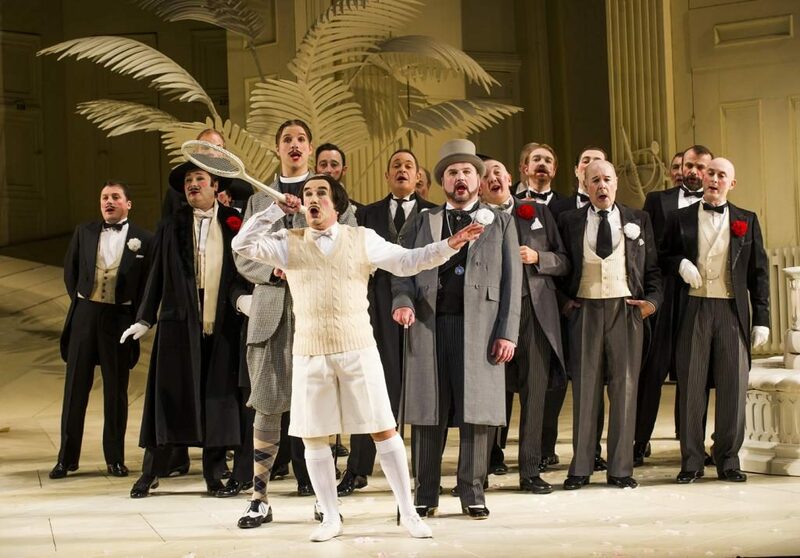 The show runs until 31 January and tickets are available via The ENO’s website.